So, what’s the point in going north of London? Why would you want to leave that nonstop British New York? And for the alternative traveler, Glasgow is the gateway. From Scotland’s largest city you can make take day trips to the Isle of Arran, Loch Lomond, and other cities, like Edinburgh, Scotland’s capital. Not only could you fly straight here, it’s an easy train ride away from London as well. The UK boasts a well-connected public transit system and Scotland is no exception. Also, the price disparity can be much smaller between bus and rail, unlike in the States, where a coach bus may be 40, and the corresponding rail over 100. If you’re planning to travel with someone else, take advantage of the Two Together Railcard, which will give you a 30% discount on all UK trains for a year. It’s a 30-pound annual fee but it quickly pays for itself. There are also other national railcards available too, so check if you’re eligible for one here. Get ready to hop around the UK. Glasgow is not a city that may be on many people’s radar outside of the UK. If someone thinks Scotland, they usually think the Highlands or Edinburgh. When we were waiting for our train in London’s Euston Station, we struck up a conversation with the guy sitting next to us, who commented on the size of our backpacks. When we said we were going to Glasgow, he said matter-of-factly, “Oh, that’s the real Scotland. Edinburgh, pffh, you might as well be in London.” While we kinda disagree with the last statement, he’s undoubtedly right that Glasgow is grittier than in Edinburgh and its people harder to understand. Seriously. People warned us that we wouldn’t understand Glaswegians and they were not wrong. Half the time we found ourselves nodding our heads like we understood – and here we were in an English-speaking country! We spent two weeks in Glasgow while house sitting, uncovering the city’s gems at a slower pace. In this guide, we share our favorite things to do in Glasgow, with an emphasis on free things to do in Glasgow, of course! We’ll start in the city center – where you’ll arrive if you’re getting into Glasgow via train. Central Station is, well, centrally located, and it was from here that we got into the city each day. We were house sitting just a 15-minute train ride into the city and we were astounded when we realized the fare was only 3 pounds round trip for both of us (with our rail pass, normally that would be 4.60, still a steal)! Aka, one tube journey in London. Can you see already why we loved Glasgow? This bustling main street has all the shops we can’t afford and all the eateries we don’t want to eat in. The main showcase here is the beautiful and elegant Victorian buildings paid for by the 19th century wealthy merchants who wanted to classy up Glasgow. Glasgow wasn’t always the artsy and alternative city that it’s known as today. 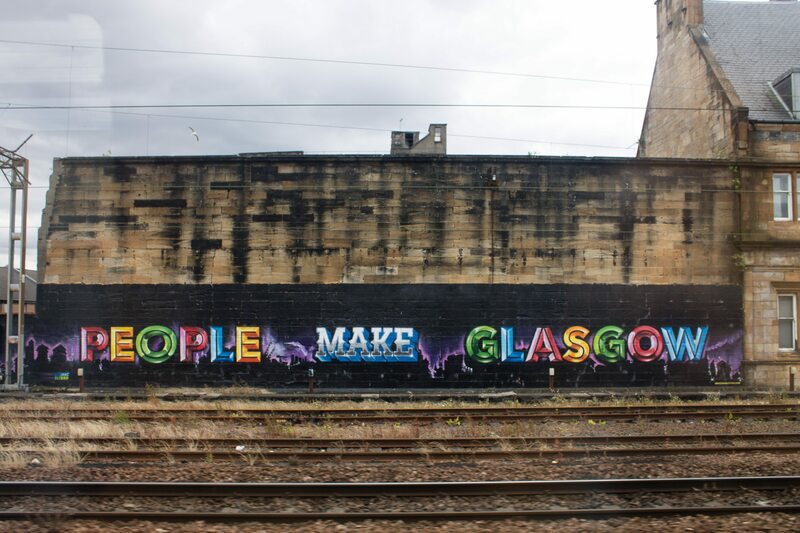 The city council made a real effort to establish Glasgow as a creative city, and one of the ways they did so was through commissioning street art. Yep, the city commissions artists to create murals and you can find these murals throughout Glasgow. So cool! Smug, the artist who created the mural below, is arguably the city’s most famous street artist, is known for his incredible detail and large-scale, colorful murals. His newest piece showcases the various seasons of Scotland – that can all be experienced in one day. But Smug isn’t the only incredible street artist in Glasgow. Walk around the streets for a bit and Billy Connolly (a Glaswegian) will greet you with Scottish pride. Several murals had been recently painted when we were there, commemorating the comedian’s birthday. Bright colors and detail seem to characterize Glasgow’s murals and they often have a sense of humor. The city’s tourism website maintains a list of the current murals on their City Centre Mural Trail self-guided itinerary. The West End was recently voted the best neighborhood in the UK and Ireland! Plenty of hang out spots, museums, and parks to explore. Check out this guide to some of the best spots in Glasgow’s West End. We didn’t spend too much time here, but we did pop into the Kelvingrove Museum, which is in the top 10 best museums in the UK. Visiting museums is one of the best things to do in Glasgow when the weather isn’t cooperating! (And it won’t most of the time). An amazingly free museum with a variety of things to see. It’s worth popping in just to enjoy the architecture and interior of the building itself! We opted for the early Scottish history and the city history focused spots. And we couldn’t miss the impressive armor and weapons gallery. There’s a great 80’s looking video explaining the different advantages that weapons provide. The museum also has a lesser famous piece albeit considered his best by many, of Salvador Dali, of Jesus Christ leering over the world. It’s surreal and religious. And if you’re looking for a bite to eat, a few blocks away is The 78, a cozy pub with seriously delicious Scottish grubs. Stay tuned for more on The 78 and other great vegan food in the city in our upcoming vegan guide to Glasgow. Traditionally the East End was the poorer neighborhood of the city. And what happens to poor, industrial neighborhoods as cities grow and become more popular? These cheaper areas become hubs of creative life. The East End is home to the famous Barrowland Ballroom, where countless bands and music artists have played over the years. There’s even a walkway listing each band and the date they performed there. Impressive in its own right is the cathedral. The darkly stained stone (industrial era pollution) and green copper roofing seem to match the broody moody weather. Even if you don’t set a foot inside, there are many things to see on the Cathedral grounds. For an all encompassing view of Glasgow, take a stroll to the top of the Necropolis, meaning the City of the Dead. Glasgow’s eminent and self-important wealthy adorn their legacies with large stone works and even a couple mausoleums. On your way back down from the cathedral, you may see an impressively detailed portrait of a hobo man with a bird. It’s actually the city’s patron saint, Saint Mungo. This beautiful mural was painted by none other than the artist Smug. The People’s Palace is a museum is for the people, with a few exhibits focusing on the more common folk of the city. Passing through the museum and going out the back, you’ll enter an awesome winter indoor garden. The greenhouse boasts exotic tropical plants with lots of descriptions. Just be careful to not trip over any wild children running amok. Glasgow Green is massive and it’s quite peaceful to walk along the paths and admire the outdoor sculptures. Sculpture commemorating when Glasgow held the Commonwealth Games in 2014. Most people don’t cross over the Clyde River while visiting Glasgow, but there are some beautiful places to see a 15-minute train or bike ride away if you’re willing. While you’re in Southside, pop over to the delicious Soy Division cafe for homemade Scottish delights. One of Glasgow’s large parks, Pollok Park was right near where we were house sitting and we spent an afternoon biking around it. There something for everyone in Pollok Park, with walking paths, mountain biking courses, playgrounds, and the historic Pollok House to visit. There are even Highland cows! If you don’t have time to visit the Highlands, definitely come by and see these cute fuzzy guys in person. There were even babies when we were there! After 2 weeks, we decided that given the chance, we’d come back to Glasgow. Not only is it a pleasant place to see, but given many day trips and endless cool vegan spots, we could see ourselves staying a month some summer. Entrance to High Street, Glasgow’s Old Street. Complete with old toll booth! Free Things to Do in Glasgow: Visit Scotland has a great resource for free things to do in Glasgow, from lists of museums, parks, to self-guided walking itineraries. People Make Glasgow: The Glasgow tourism board’s website – packed with info and useful resources on all things to do in Glasgow. Vegan Guide to Glasgow: Our guide to the best vegan restaurants, cafes, and pubs for our fellow plant-based peeps! Have you been to Glasgow? What other things to do in Glasgow would you recommend? Pin Things to Do in Glasgow!